Sharp Shoot R Precision Products® announces new for 2018 “Brass Monkey Case Shine™” a product specific for polishing the brass cartridges for rifles and pistols. This new product is an answer to easy polishing of brass cases. This exciting new product is faster and easier to use, and leaves no messy residue. “Brass Monkey Case Shine™” polishes to9 a mirror shine with much less effort. We are packaging this product 8 ounce bottle. 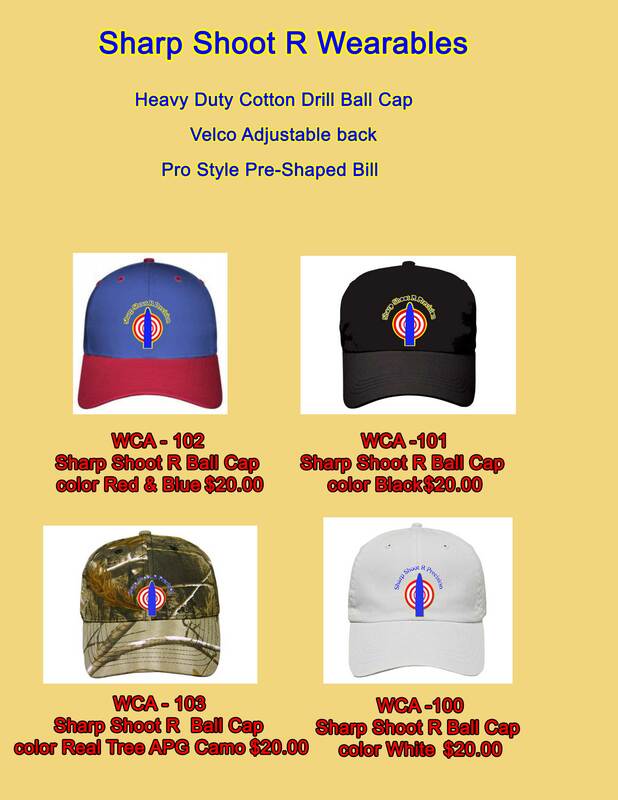 It is very easy to use and is extremely great value …. This one 8 ounce bottle will produce more than 42 applications. “Brass Monkey Case Shine™”will cost less than 36 cents per application. Most other brass polishes are diluted liquids. Expensive to ship, and are limited to just a couple of uses. Brass Monkey is very concentrated. The ratio is one teaspoon of Brass Monkey Case Shine to 1 lb of media. The normal amount of brass you can polish is more than 43 batches. The value is evident when you compare this product with all others. It’s a fact that clean polished brass is easier to reload and is much less stressful on reloading dies. I would point out that it’s more important to have clean brass than shiny, polished pretty brass. You may use any of two proven methods to polish brass. I. 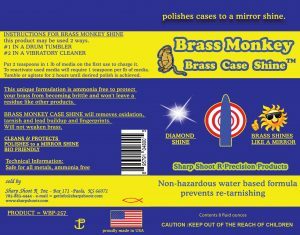 “Brass Monkey Case Shine™” will protect cases against corrosion. II. 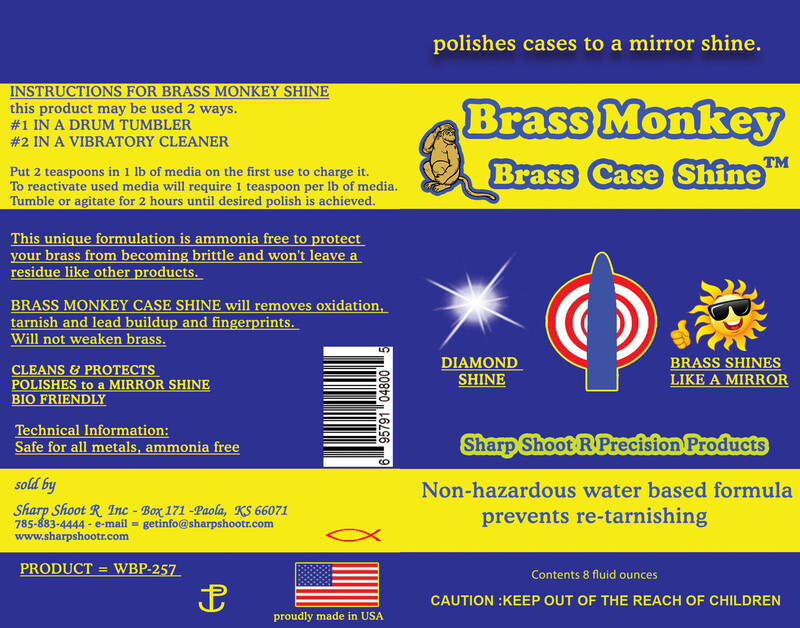 “Brass Monkey Case Shine™”Biodegradable, and is totally safe for to use. III. “Brass Monkey Case Shine™” is extremely fast acting. IV. “Brass Monkey Case Shine ™” leaves cases clean and bright leaving no tacky residue & no water spots. The final product “Brass Monkey Case Polish™” has undergone extreme testing by Competitive Shooters and reloaders . P.O.Box 171, Paola, Kansas 66071.